We continue to go back and forth to celebrate fragments from other decades. The celebration of the 1980s had happened for a while and something else will eventually come over. 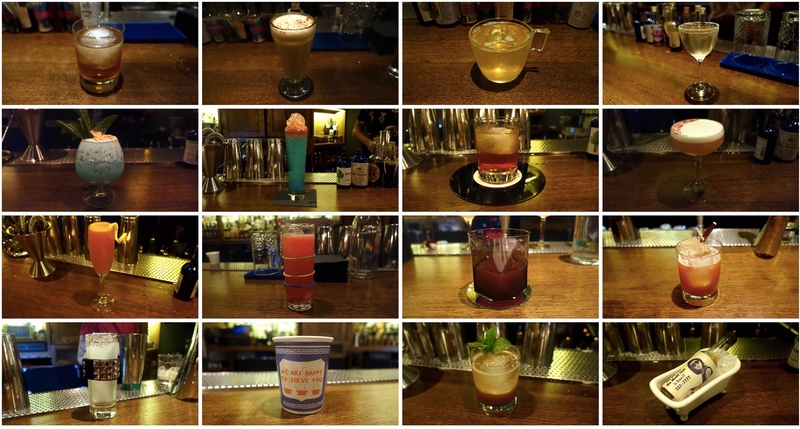 In the world of cocktail bars is no different when speaking about thematic menus or a list celebrating eras of drinks. Still, I find my experience of time and space through ‘New York 1983’ menu at Pouring Ribbons to be quite an interesting and engaging one. It was the period when disco slowly fading away. The whole city was bankrupt, and every block was as sketchy as it gets. When artists were able to move around Manhattan and built the art scene. The drag culture was coming to the villages, and drugs can be found in every corner and everywhere. It was considered to be the wildest and weirdest years of this city when anything goes. The time that much shaped the nightlife, music and art scene of today. A cult story about a gang and their deadly escape through subway from the Bronx to Coney Island after being framed. This is an interpretation of both the film and the book that the latter is much more depressing and violent. The outcome is a clash of spirits representing races in The Warriors gang of their strength and brotherhood. Pour straight out of an imitate spray can. During that time, not only people don’t really wander around just anywhere, the subway is almost the last resort they want to board on. The sweetness of brandy and allspice slides in as the first touch. Followed by a clean Mezcal with fresh sweet orange and spices, then a sweet-peaty kick at the end. Kind of making me thinks of it as a sort of hybrid between Mezcal Old Fashioned and Rusty Nail. A long-standing 24 hours newsstand where hippies and punks used to hang out. It’s also a name of a painting by Jean-Michel Basquiat in 1982 and famous for its egg cream that some believed to be created there. The small bites from the bubbles, then cognac and layers of vanilla foam curl up smoothly with cream sherry, and clean cacao ends. It’s way more sophisticated than the normal egg cream but share some resemblance features. For example, the fluffy foam that gives a bit of zing. The egg cream at Gem Spa has bigger bubbles and spacious mouthfeel but more flat, while the cocktail one has relatively eggy creamy build. In the end, both deliver a comforting feel, and those who had had the egg cream before will be pleased. If you crashed into your favorite diner in the villages and asked for the hair of the dog. This is probably what they will give you. Based on ‘Pancake shot’ of Jameson and butterscotch schnapps with orange juice as a chaser. This mug drink is all the comfort sweet-tooth taste of the diner that’s juicy enough but not too fizzy. Think hot apple cider, cereal and Yabluchnyk (Ukrainian apple cake). This would be a fun chaser or a nightcap. Funnily as we just had the bomb cyclone similar to the blizzard that bitterly crippled the city on 11-12 February 1983. This drink was cooling and slightly light body. But only at that moment, it’s about to get very fruity and juniper. The sherry caught up and steers the whole thing towards a tanginess. The rimmed glass gives a lightly savory taste with a lick of cardamom and anise and the looks of snowflakes. Almost reminds me of a savory Tuxedo. Ruza Blue aka Kool Lady Blue and her British friends kicked start ‘Wheels of Steel’ party in 1982 at Negril and later moved to the Roxy. Without age restrictions and other rules like the then famed Studio 54. It fueled the hip-hop culture and merge very diverse groups of people while creating grounds for hip-hop to grow in downtown Manhattan. The place also contributed much of electronic/dance club environment. This is almost like a spiked summer slushie from childhood with the Caribbean party feel. Lingers with a sugary aroma that lays among cotton candy, bubblegum, and cream soda. On its midway, though the sip has surprisingly kicked of cakey fondant scent as well, and the toasted coconut was just fulfilling and bring a pleasure when biting afterward. An easy sweet treat that doesn’t leave saccharin aftertaste or after a few sips. Yes, it’s vividly sweet like a snow-cone that you have in a park to cool off while watching street dances and people rhyming out words. A lively take on 20th Century cocktail. The liquidly sour part was a bit off. However, the strange pointy smokiness maraschino-like and dry woody citrus may be confusing and perplexing. It gives similarity of that moment when sucking off the snow-cone and that swell of sweetness from taking in the syrup. He’s the pioneering DJ to form the birth of hip-hop up in the Bronx with his turntables and block parties that helped bring together a sense of community within the crime-ridden areas This glass is praise for what he’s done by honoring his roots from Jamaica and that single vinyl underneath the glass represents the records he spins on turntables. This strong and profoundly subtle build gives a feeling almost as if you are sinking your teeth into a fresh sugar cane that later develops layers of sweetness. Very lively with a delicate flash of oakiness along an exciting small touch of spices and bits of sweet fruits. A light and airy foam with a sprinkle of flowers laid a soft and vibrant introduction. It has a light sweet tart snip. Almost aggressive but elegant and comforting at the same time. It ends bright and clean. A sour drink with perfume-like floral aroma and tea can barely disappoint and this one lay just about right somewhere between White Lady and Sidecar. Which bounds well when talking about Lady Pink and her pieces. An essential female graffiti artist who had painted numerous murals and people had seen her pieces on the subway trains in the 80s. I’d say her pieces are a mix of bold contrast of colors with and tender lines that fills with youthfulness. Kind of straightforward (to me), bitingly fizzy, heavy on tropically sweet and fruity with zestily off dry. Aims to be an interpretation of 1983 fusion Jazz album of the same name by Miles Davis into a cross over of French 75 and an Avenue cocktail. It has a comparison of Brandy to high notes of trumpets, sparkling bubbly like bass, and fuse with sweet abstraction complexity from overproof rum. That small lemon spiral is also a trivia to a day he walked down 8th Avenue in his brown suit and couldn’t see his reflection. He decided to buy a yellow tie to cheer himself up. The first location of the famed four stories nightclub in midtown (252 West 37 St.) to be the after-hours gathering all the people from different clubs and genres. Also where Madonna work and first performed, making the jelly bracelet (rubber band on glass) one of the hottest clubbing accessories thanks to Maripol who’s was the person behind her look. This is a party vibe drink that can be associated with a nightclub. Having the typical and prominent of what I would call some MSG-ingredients of the cocktail world (Elderflower, Cinnamon). The light punch-like drink is has a heavy note of grapefruit and Aperol. However, the scarlet tea of In Pursuit of Tea along with St-Germain and spices make it a smoother and not overwhelmingly florals. Just what you’d likely want to drink and dance after-hours at Danceteria. A homage to drag ball and their houses. This continue-to-develop drink makes you feel unexpectedly been thrown a shade. From an infamous shot-reputed Jagermeister. Sassiness from ginger, and cocoa like how drag queens used cocoa butter as skin care while looking into the mirror and putting on makeup. Before they go out to voguing and throwing some shades. This cocktail stunned you quite in an unexpected way. The first smell you inhale might be a bit oddly smoky sweet and slightly fermented sour. Once sip, it’s a juicy charred-sugar cane taste with a zing of ginger and a faint smell of mint and chocolate. It later develops into deep spiced and herbaceous-minty and dark fruits with the dry sweetness. At the very end after swallowed, it was as if a tiny spread out spiced and buttery sugar bits are melting on your tongue. This closed-loop drink gives out a french feel from Rhum and how perfume sillage-like it smells. An appreciation to Maripol which is French. It tastes as if you take a bite of an apple. That waxiness then tartness changes into juicy sweetness with a little bit of rhum. The following part where the dried plum and dried flowers fragrance then candied apple finish along with a lovely and clove cigarette/incense-like smoke. ‘CBGB OMFUG’ Well, you must have heard about this legendary divey club that boosted punk rock and new wave culture (315 Bowery). This wacky but refreshing drink is a translation of how smoky, rusty and sweaty the ambient was. It’s lightness and celery taste connects earthiness, dried leaves, and dry sweet bee pollen-like scent altogether. Another drink for uplifting gormandizers. If you like celery and tequila, and touches of savory then go for it. Named after a song by Lou Reed from Legendary Hearts (1983) about leisurely watching the day goes by (Probably after a long night out). It’a almost a simple drink but swing you a surprised on diverting equation of tasting notes where you expected how spirits would usually go. The Rye paved its way on its warmly butterscotch with light leather but freshen you up with cold-coffee and herbal tea taste, sweet berries and grass jelly-like notes. The finish wasn’t the spicy and dry, but somewhat clear dark fruits scent. Well verse with the lyric ‘no sugar in my coffee, how’s your tea?’. Yeah, I’m having both at the same time in an Anthora cup. This is a peculiar drink (to my taste) is based on whiskey smash. There’s a big tease of nutmeg and mint. It tasted light and diluted with vibrant of herbs. However, the oddest part is the savory toasted nuts and caramelized shallots at the end which reminds me of Massaman curry. As much like the TV Party show that seemed like your usual tonight show full of fresh minds and faces. Yet, there are some unusual things elements like waving handheld camera shot and the mix of strange performances. Even if Mudd Club shortly operated from 1978-1983 in TriBeCa (77 White Street). It was ‘the place to be.’ A building with exhibition space and rotating gallery, bar, live music mostly feature no wave and new wave. It was one of the hippest spots in downtown where people were always trying to get past the door policy into this hub to know what’s coming and going. This cocktail in a bottle is supposed to depict how the bar of Mudd Club used to chill their beers in a bathtub. And its liquid content to speak of the atmosphere. The Grand Poppy Liqueur equal Heroine and Gentian Amaro as Coke (I was told freshly cut gentian shares the same smell). The scent of this Manhattan riff was stiffly powerful but strangely cooling. I can Imagine the stench of the club filled with smokes and drugs. The brownish liquid was surprisingly a shifting of smoky brown sugar taste to dry hibiscus and blows of harsh floral and gentian aroma. It delivers quite a steep and long exhilarating bitter ends. Rather than showing-off specific spirits or repeatedly use of ingredients throughout the menu. Most of what has been put to be poured into the glass have its reasons and are tied to the theme, not just thrown in because it tastes good. And it’s not about straightforward flavors but using various sources of flavors like fortified wines and crisscrossing spirits that deliver a developing of provocative notes and depths. Another thing that I laud is how the whole team and staff were all engaging in this menu and creations. Though it is chronologically designed but adventurously jumps around the numbers will still deliver the experience. As the taste or style barely repeats itself. They are good alone but better when you get to hear those backstories. Thus, to feel involved in this menu requires some examine to understand the interpretations and how some drinks work as supporting drink to the whole theme. It’s much more enjoyable when you start to connect the dots on how the neighborhood, the scene and mutual appearance of iconic people are all connected. Some of the notable drinks from this menu that I like were Mudd Club, Rooftop Garden, Throwing Shade, Kool Herc, and The Warriors. Thus, other glasses and lighter drinks do build up the stories, and some works like a pick me up or a break from other strong ones. None of the drinks force you into their theme, but they were enough to partially stay with you or even trigger you to explore it. At some places, the interior and decorations already helped set the tone. However, this whole menu created an imagined world of 83 and took you through the days and nights of the past. The shifting of the scene from uptown to downtown to the villages and nearby the Pouring Ribbons. It was fun to look how people, places, and creations have flourished and withered 35 years later. Celebrating moments that are already gone, areas that are still there and other things that are disappearing. The whole thing introduced me that period and urged me to unearth exciting things that happened and shaped New York City. This menu will be available until April. Stop by for bits of 1983 before spring menu come.